This project may take several days to complete because some stages need a drying period. The slide show on the right is a step by step guide. Cut the polystyrene block to the required profile and glue to the baseboard. Stack blocks if more height is required. Cut the gauze into 150mm strips. Mix the plaster with water to a consistency such that it just drips off the trowel. Apply a thin layer to the polystyrene and press the gauze into it, followed by another layer or two of plaster and gauze. Leave to dry completely. Paint the plaster. 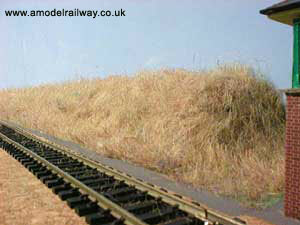 This will gives us an acceptable base colour to show through if our "grass" is thin in places. If the embankment borders a road or path then paint in the asphalt at this stage. Leave to dry completely. 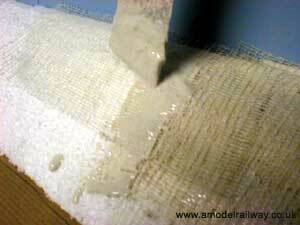 Apply the PVA glue in narrow bands and then fully cover with the spreader. The entire surface must be covered to the very edge but not too thickly. Cut the fibre mat into manageable slabs. Cover the required area pressing firmly into the glue. Leave to dry completely. 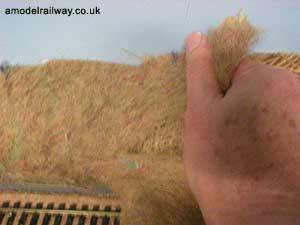 Gently pick the bulk of the fibre mat away from an edge. When you have enough bulk to grab hold begin pulling it back onto itself. 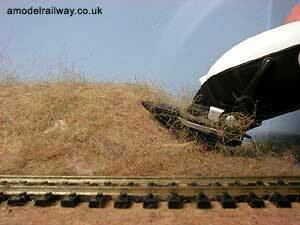 You will be removing most of the mat leaving a layer stuck to the embankment. DO NOT PULL STRAIGHT UP as this will rip the plaster off the polystyrene. With the hair comb lift the fibres. Pull clumps off where there is too much bulk. Then cut the fibres to about 6mm height with the scissors or electric hair cutter (number 2 comb). Comb again to lift the fibres and remove those that are loose. Trim areas that look too bulky or too tall to end up with a rough hairy texture. 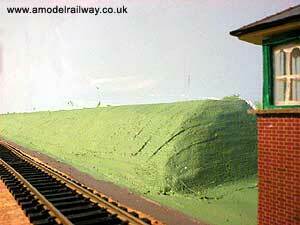 Do not worry if the base paint shows through although completely bald areas will need to be patched. Thin the green paint to a consistency that can be sprayed and add a drop or two of washing liquid. Mask adjoining areas and spray thoroughly. 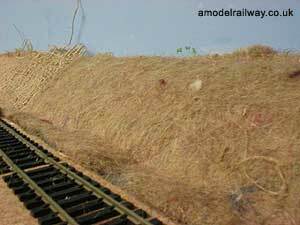 When dry go over with the comb to lift or straighten the grass and cut any blades that are too long. 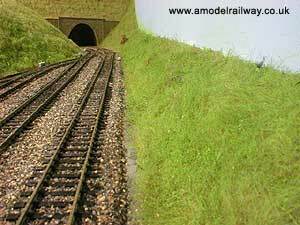 If required plant the embankment with trees and shrubs. These can be used to cover areas should the grass be too thin. 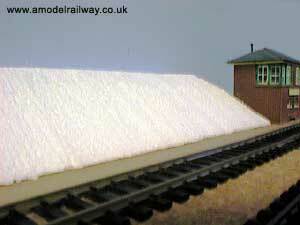 Polystyrene block, ideally a solid block used for wall insulation available from DIY stores. This is inexpensive. Bonding Gauze, typically used for covering plasterboard joins. Any gauze will do, e.g. first aid bandage. Textured Ceiling Plaster. Any plaster that dries hard will do. Polystyrene Cutting Tool, e.g. bread knife, hacksaw blade or hot wire. Small Trowel, to apply plaster. 25mm Paint Brush, to apply paint base. Glue Spreader, with serrated edge preferred. Dressmaking or Hair Scissors, and/or electric hair clippers. Modelling Air Spray Gun and Propellant. Preferred, but dabbing with a paint brush is possible.